Our exploration into Robbie’s vocabulary continued after bedtime. He’d been “down” for about an hour when we went in to check on him. Our cherub had, once again, thrown all of his toys out of the crib and taken off his diaper. But this time he went a step further. When Justin went in to investigate, Robbie said, “Dirty.” We had no idea… Until Justin stepped in the puddle. And discovered that the floor, the sheets, and the mattress were all soaked. Great. Just great. It seemed like a good idea, this whole whale watching thing. Rob likes boats. And, well, who doesn’t want to see whales on a gorgeous June afternoon? 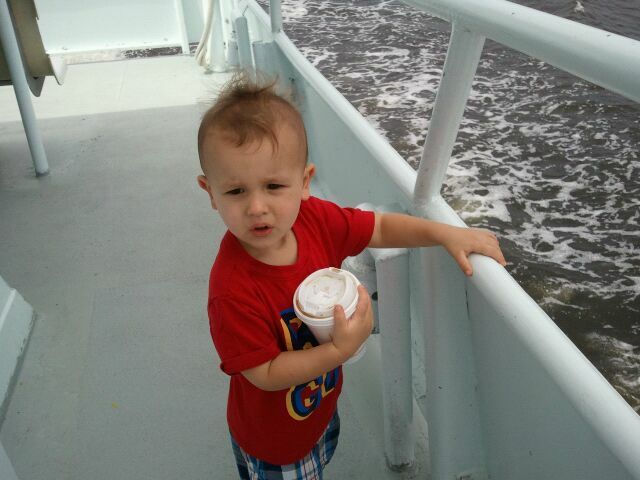 The event started out smoothly enough: Robbie loved exploring the boat, cup of Dunkin in hand. He waved to all the boats as we passed them, stared at the rushing water, and said, “Holy cow! Moo!” about a dozen times. And then the first thirty minutes passed. And the second. And the third. And nothing was exciting for my child, who was, at this point, two hours past his nap time and declaring his extreme hunger and thirst while expressing his disdain for everything offered him. After two hours of seemingly aimless sailing, we finally came upon a humpback whale! We all ran outside to keep our eyes peeled for the next spouting. Rob leaned up against the railing, saying, “Here, whale, whale, whale. Come play,” over and over. And, suddenly, there one was! I was looking to the right when I heard Robbie yell, “Whale!” and point to the left. Sure enough, there was a whale breeching! Robbie actually spotted his first whale, one named Gondola. We were fortunate to have the opportunity to see another whale, Pinball, about twenty yards from the boat. It was absolutely incredible to see this huge animal glide through the water so seemingly effortlessly. Robbie squealed with delight every time he saw the whale, pointing and exclaiming, “Whale!” Although Justin was taking a nap to recover from seasickness, I really enjoyed the one-on-one time with Robbie, showing him something so incredible. After all, there’s only one first time to see something as incredible as a humpback whale. During our hour trip back to Newburyport, Robbie continued to deteriorate. The only thing he put into his body all day was a medium coffee, 32 ounces of water, some Diet Coke, three pieces of orange, seven pretzels, and two mini cookies. I was calculating all the liquid the cherub consumed and the number of diapers we had used (at that point, two). And then I felt it. And it was warm. And wet. Soaking wet, actually. 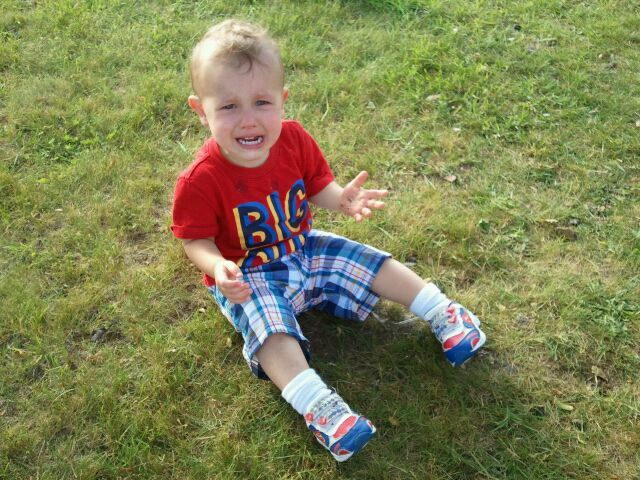 Yes, as I was comforting my tantruming, exhausted toddler, he peed on me. A lot. I’d like to say I calmly moved Robbie, but I more tossed him aside, only to see a pool of liquid being absorbed into my shirt. Thankful that Robbie at least hadn’t hit my shorts, I sent Justin to find a t-shirt. After all, what whale watch would be complete without commemorative shirts? But my dutiful husband came back empty-handed. He assured me that it was funny and that my shirt would dry. Unconvinced, I took my urine-soaked self and found where they were selling t-shirts. Dry, and much happier, we docked and headed to New Hampshire for dinner at Markey’s. Robbie hung in pretty well, eating his grilled cheese and sampling lobster. True to tradition, we headed to Dunlap’s for ice cream afterwards. Not in the mood to share with Robbie, we ordered a baby ice cream cone for him. 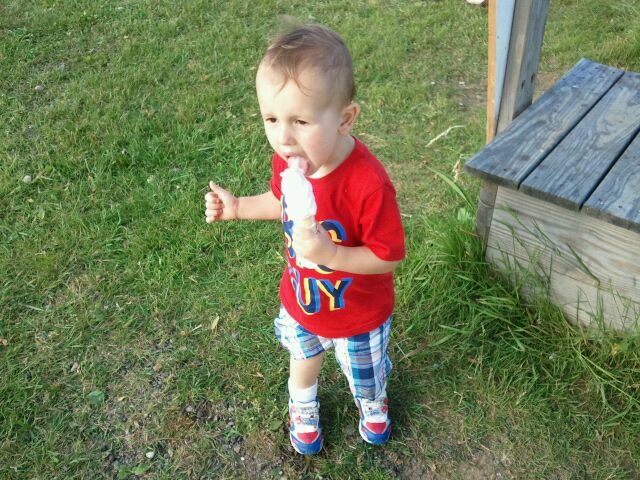 He ran around the field, enjoying his own ice cream. The sheer joy of this lasted for only a minute. You know, until the whole thing toppled to the ground. Robbie screamed like he’d lost his best friend, crying, “Dirty! Mess!” for the next ten minutes. Rob was inconsolable for the next ten minutes, refusing any ice cream at all until MPaPa (Grandpa) offered him his vanilla cone. Then, they were best buds, sharing a cone. The ride home was complete with MPaPa asleep and snoring in the backseat and young Robert imitating him and snoring from his car seat. There’s nothing like trying to be just like MPaPa. I climbed on the scale this morning. You know, just to see how I was doing. And I stepped off. Then I stepped back on, just to check and make sure it was working. It was. 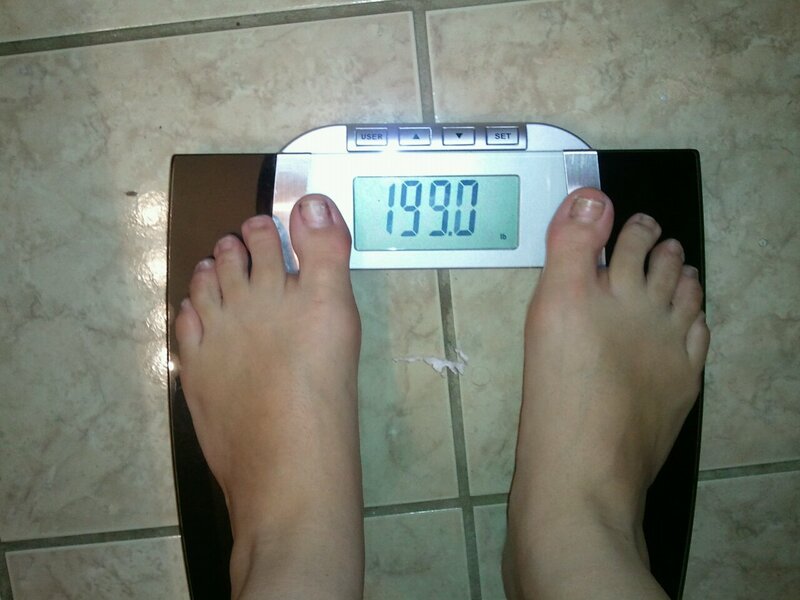 My scale read 199.0. Three times. I did it! I have shed 86 pounds in under 23 months and finally dropped below the 200-pound mark. I’ll be honest; I didn’t really thing it was ever going to happen. I’ve been dancing around it for a month now, dealing with a mental block. Rectifying who I am now with who I have spent my entire adult life being. And I guess I finally decided that I was ready to move forward. It’s a funny thing, this moving past a big obstacle. I felt different immediately, walking a little more proudly, feeling like I was finally in the land of acceptable. Even the gym was different. I wanted to quit today, especially after the past few days I’ve had at work. I didn’t want to run 2-minute sprints at 6 miles per hour. But I did. Because not doing them was something someone over 200 pounds might have done. But not me. Not this girl. I can do anything. Forty-eight hours of labor? Check. Lose 86 pounds? Done it. Pull out a three-minute sprint? Piece of cake next to everything else. He’s saying new words every day. Today, when I dropped him off at day care, Robbie pointed out a “forest” to me. He doesn’t even know the word tree, but he knows forest? We’re talking about toys and friends and planes. But I really got thrown for a loop when we got home from the gym tonight. Robbie had been telling me that he was “tursty” the entire way home, despite drinking all of my water. So, you can imagine my surprise when he brought me a cup and said, “I want juice. Peese.” Are paragraphs next? I don’t think I’m ready for that! Last night was Tuesday Night Dinner with Micah and Allie, so Robbie and I headed to their house around 7:00. Once again, after dinner, I put Robbie to bed and assumed he was down for the count. An hour later, we heard the sound of something small and metal hitting the floor. Allie and I looked at each other and jumped up, both of us saying that didn’t sound good. And it wasn’t. Now I’ve learned my lesson about putting Robbie to bed at Micah and Allie’s. I dutifully cleared the bed of laundry (Allie had removed everything else), pushed things back from the shelves, and set up the Pack ‘n Play as close to the bed and as far from the dressers and shelves as possible. None of my efforts mattered. In a move that I would have paid good money to see, Robbie shimmied the Pack ‘n Play four feet across the floor to Allie’s dresser. Her underwear was strewn across his bedding, drawer hanging open. Half of a lint roller had been unfurled, creating a large, if not sticky, ball, which sat in the corner. And then there was my child himself, standing facing the door. I believe I may have heard, “Uh oh,” escape his lips when Allie and I walked through the door. 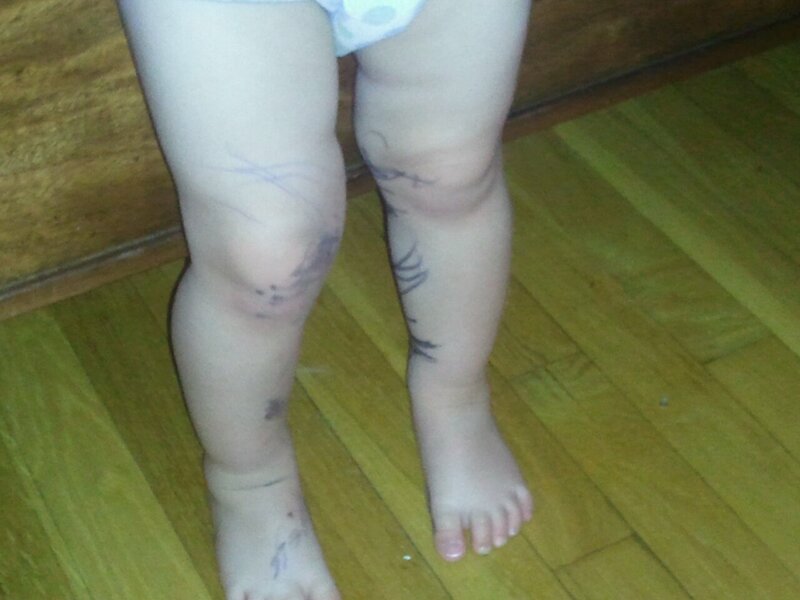 He had an uncapped Sharpie and had been using it to entertain himself for a long time. Fortunately, none of the ink reached the wood furniture (in the event that happens, I recommend using a Magic Eraser). It did, however, reach the sides of the Pack ‘n Play, the books, the credit card resting on the dresser. You know, pretty much everything around. Oh, and my child. It reached him from head to toenail. His face, fortunately, had only a few, easily removable swipes of marker. His palms were covered. His legs, well, those speak for themselves. I actually didn’t get them cleaned off. Partly so I could get a picture in the morning (you wouldn’t believe me if you couldn’t see it). And partly because there was just too much to try to remove it all. After all, Allie only had so much hand sanitizer (apparently excellent for removing Sharpie in case you were looking for another quick rememdy). We’ve been working on the word “share” with Robbie lately. I think not having the right words has fostered his frustration lately, resulting in toy-stealing and hair pulling when a certain little girl stands her ground and doesn’t give the toy up immediately. So, whenever I give Robbie anything, I have him ask me to please share. And when he has something I need, I ask him to please share. I’ll be honest; I was pretty impressed that the whole sharing thing seemed to take. However, until we left the grocery store this afternoon, I wasn’t sure he really understood. Because Robbie survived an entire day driving to and from Maine and going in more stores than any man would ever care to visit in a two-hour period, I bough Robbie an Elmo balloon at the grocery today. He carried it all through the store, delighted at his new Elmo. When we got into the car, Robbie deftly pulled the balloon inside and next to him. Once he was in his car seat, I peeled a banana for Robbie and asked him if he could show me how to share the banana. You know… Like by giving me a bite? I don’t really remember what a good night’s sleep feels like… I haven’t had one in so long. For the last two nights, Robbie has woken up screaming in the middle of the night. I actually think he’s having nightmares; when I go into his room tears are streaming down his face. He gloms onto me, afraid to let go it seems. Unfortunately, he hasn’t been able to put himself back to sleep for the past two nights. Of course, it might have something to do with the fact that we had company and I was somewhat reticent to ruin Louisa’s night of sleep as well. (Occasionally, I have some manners). This resulted in a toddler occupying a seemingly larger percentage than he should have. It sounds sweet, you know? Cuddling with a little boy, relishing perhaps a tiny bit of baby smell. Let me assure you. It is not. Particularly when he snores. Sure, it’s not the rafter-shaking snores Justin can produce. But it’s definitely not the quiet mewings of a new baby. As I’m trying to relax, it just reminds me that my time with a precious baby is quickly fading. And that, sooner rather than later, he will become a real boy. My best friend from high school was in this weekend for the fabulous NKOTBSB concert at Fenway. 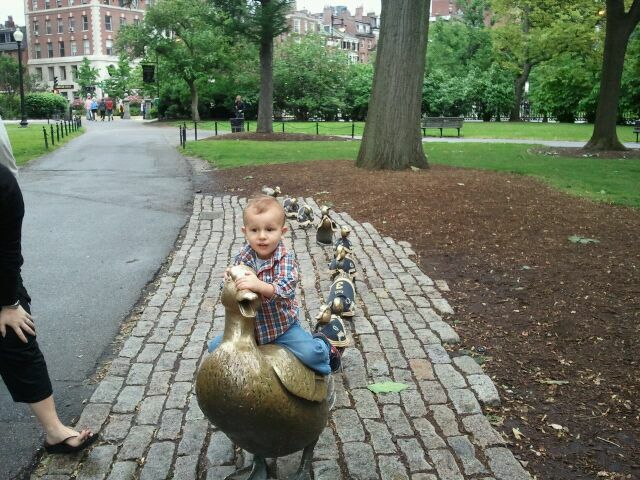 Since Louisa had never been to Boston before, Robbie was happy to play tour guide for the morning. 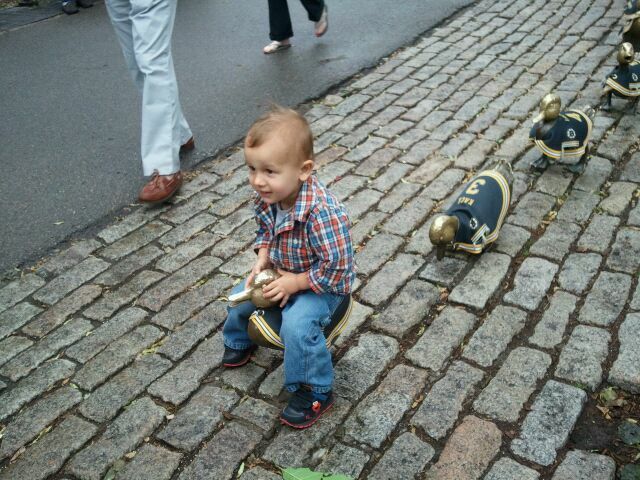 He showed Louisa the Make Way for Ducklings statues, complete with Bruins jerseys for each one. And then he was off to see the real thing. After all, what’s better than live ducks that actually quack back when you quack at them? When Robbie walked over to the pond, there weren’t any ducks nearby. However, as soon as they spotted Robbie, three or four of them swam over to quack at him. He was so beside himself that they came to see him, it was all I could do to keep him from hopping in the pond with them. I’m not sure what we’re going to do when the Res opens and we go swimming. 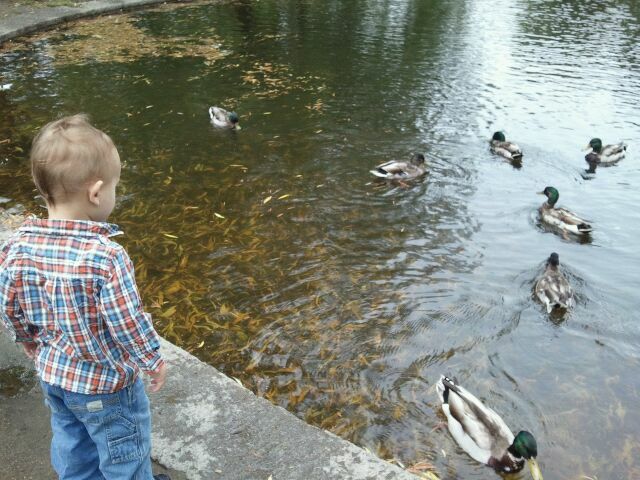 There are ducks there, and I have a feeling a certain toddler will be swimming after them. At least then it will be warmer than 50 degrees and he’ll be dressed for the adventure! It’s funny how toddler brains work. I’m noticing that Robbie’s seems to rapid fire, placing random things he knows and can say together, even if it doesn’t really make sense. His new favorite saying? “Holy Cow! Moo!” I guess it makes sense. Cows do say “Moo.” But it really only confuses things that Robbie’s giraffe is named Moo. Last night, we put Robbie to bed early. After all, he’d only gotten seven hours of sleep the night before (we had to be up early for a 10K, that I finished in an amazing 1:15:19!). Despite a four-hour nap, Robbie was cranky by 6:30. So, he was off to bed where he fussed for a while before finally falling asleep. Justin went up a few hours later to put some laundry away and immediately called me up. And there he was. My son, naked from the waist down. He had tossed his pants over the side of his crib and chucked his diaper into the hallway. So we did what any responsible parents would do: we took pictures. And, in a shocking move, I will not be posting them here even though nothing is showing. 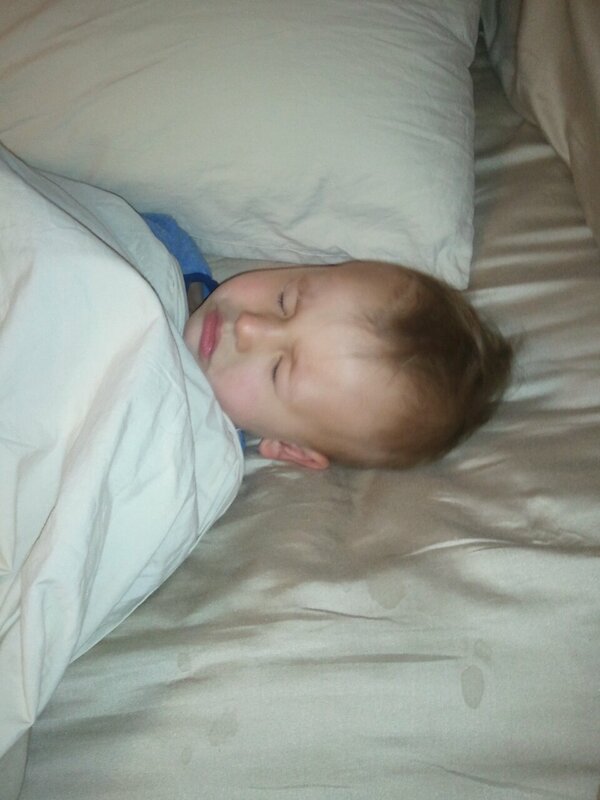 Imagine my surprise this morning when I got an email from Justin telling me that he found our son awake in his crib. Naked from the waist down. Needless to say, tonight he’s sleeping in footed pajamas. After all, one of these mornings he’ll have poop in his diaper.